Compare prices from several car hire companies in Caceres and find the best price for car rental. Our prices always include unlimited mileage and insurance. 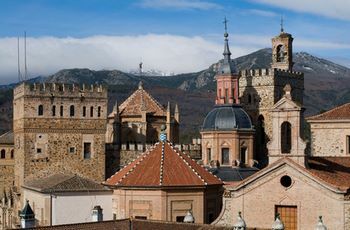 Cáceres is the capital of the province of the same name and located in the central part of Spain. From the city is about 100 km to the Portuguese border in the west. This is a very old city that was founded by the Romans in 74 BC Kr, and the population of Cáceres was measured at nearly 95 000 in 2010. The old town is well attended and is listed on the UNESCO list of world heritage. The district is surrounded by an old city wall, where some of the parts derived from both the Roman times and the Moorish period. There are many historic buildings, including San Mateo church from the 1500s. Badajoz Airport is approx. 90km southwest of Cáceres and offer flights to Barcelona, Madrid, Valencia and Paris.